There are many of these trees in my neighbourhood. This is the first one that has bloomed. The white flowers that are to me exactly like orchids cover the trees in early summer for such a short time…a week at most. Then they fall and cover the sidewalks, the cars, the lawns. For the rest of the year they are ordinary trees, their leaves rather pale green and in winter they are unattractive with their long “bean pods” that are their way of shedding seedlings. Icy winds rattle their twisted branches and the pods eventually fall off. 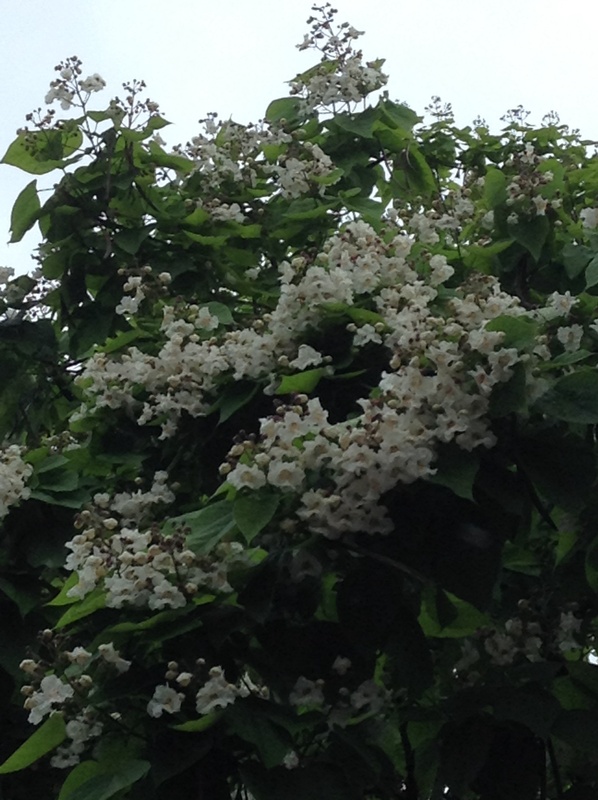 Only now, in June are catalpas like young fresh brides adorned with these lovely blossoms. Bless the city worker who thought these would be a good idea. Truly the beautiful living things that surround us. especially in early summer (or is it late spring’) are more beautiful than any bride, except for a bride that is hopelessly in love with her groom! Dearest Isobel The happiest day! Masha came and told me about your plans I and idea Since then I can’t stop rejoicing and being full of gratitude to the Lord who is sending me such special friends, who make my life easier to live and love Your little house is being freshened up ready for you Let me know when? Big hug from Babu.